Location: Situated to W of Dale village, just E of Dale Castle. 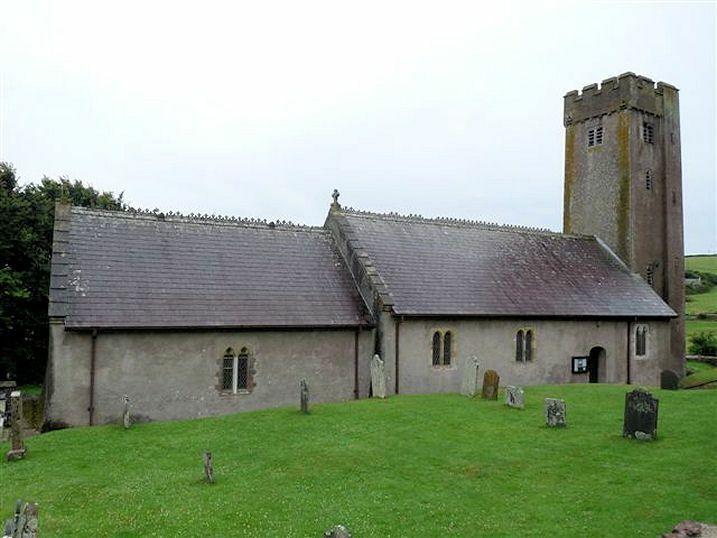 Anglican parish church, late medieval tower with nave and chancel rebuilt in 1761 and thoroughly remodelled in 1890 by F.R. Kempson architect of Hereford and Cardiff. Some further work in 1903. All roughcast, slate roofs with coped gables and cross finials. Tower is slim, sheer with battered sides, slightly raised NW stair tower carried through corbelled and embattled parapet to plain parapet at same level. Small slated recessed pyramid roof. Small late medieval ashlar square-headed bell-lights, 2-light E and N, single-light W and S. 4 loops to stair tower N. N side has 2 cusped lancets and W one similar. Nave has 1890 plain 2-light windows, 3 to N side with elliptical arched doorway between first and second, and 3 to S. Chancel has one to N and S and stepped triplet E window. Battered wall base suggests medieval fabric. Plastered walls and 1890 boarded panelled roofs. Pointed chancel arch with sides stepped in at bases. Tower base is stone-vaulted, pointed and plastered. NW stair door and stone square winding stair. Segmental pointed relieving arches to windows. 1890 pews, timber open-fronted Gothic pulpit on stone base, iron and brass rails and patterned floor tiles. N door has dated 1551 and 1890 in nailheads. Blocked S door. Early C20 panelled stalls with quatrefoil friezes. Fine and unusual large white marble font of 1761, said to come from Italy, oval deep bowl with recessed band and moulded cornice on octagonal stem with rounded octagonal ring and moulded octagonal splayed base. Early C19 ogee timber font-cover with cross finial. Stained glass E window of 1894 by A. Savell & Co of London, Ascension with SS James, Peter, John and Mary. Memorials: Nave E marble plaque in grey stone reeded surround with arms on base to David Paynter of Pembroke (d1802), Joshua Paynter of Dale (d1805) and Mary Paynter (d1815). Nave S gothic plaque to David Runwa Paynter, (d1864), by King of Bath and marble scroll to T.M. Davies of Broomhill (d1865) by Wood of Bristol. Chancel N neo-Grec plaque in slate and 2 colours of marble to John Lloyd of Mabws and Dale Castle (d1820), John Allen Lloyd (d1805) and Henry Lloyd-Philipps (d1826). Parish church with late medieval W tower. Situated in Dale Cemetery at W end of Blue Anchor Way, W of the village.